Concrete stain chemically bonds with the concrete, so the finish will not flake or peel like painted concrete can. Concrete stain is permanent, low maintenance and available in a variety of colors. Builders and homeowners often use concrete stain to mimic the look of natural stone without the expense. Turn dull, gray and unattractive concrete blocks or pavers into a warm, inviting patio with the simple application of concrete stain. 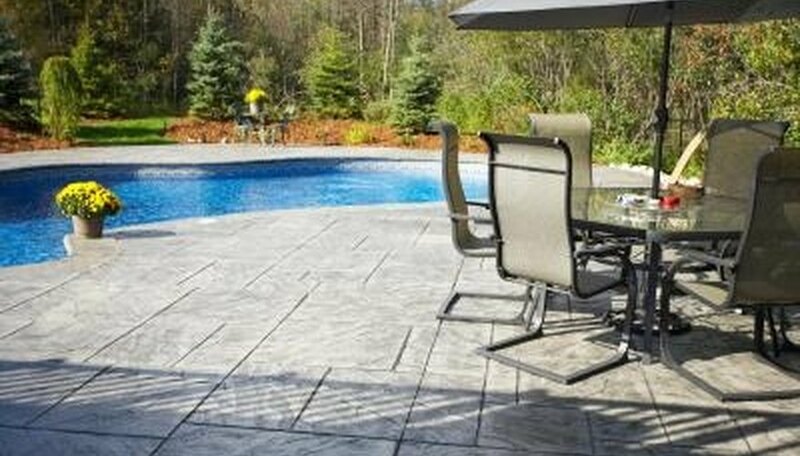 Clean the patio blocks with soap and water using a scrub brush, or clean the blocks with a pressure washer to remove all dirt, grime and grease from the blocks. Concentrate on stained areas because concrete stain will not cover or mask imperfections in the concrete. Cover the areas around the concrete blocks with plastic sheets to protect them from the acid in the stain. Put on safety gear including goggles, heavy gloves, long sleeves and long pants. Acid-based concrete stain contains muriatic or hydrochloric acid, both of which are skin irritants and eye irritants. Do not get the stain on your skin or clothing. Open the valve on a paint sprayer and pour the concrete stain into the sprayer to the fill line. Then close the valve on the sprayer. Use a paint sprayer with no metal parts that can be damaged by the acidic stain. Spray the concrete blocks with an even layer of stain. Spray one block at a time and work from one side of the patio to the other, making sure that stain is applied in the crevices between the blocks. Wait the time recommended by the concrete stain manufacturer or until the color on the concrete blocks is the desired concentration. Mix baking soda with water to form a thin paste and scrub the mixture into the blocks in a circular motion with a scrub brush. Baking soda neutralizes the acid, stopping the chemical staining process, so work quickly to avoid uneven color in the blocks. Rinse the baking soda from the concrete blocks with a garden hose. Acid-based stains are available in limited colors, usually only earth tone shades, but water-based stains have a wider variety of colors to choose from. If you use a water-based stain, you must apply an acid wash to the concrete, then neutralize and clean the acid away before applying the concrete stain.